OpenSignal launched its meteorological data crowdsourcing program, called WeatheSignal, 14 months ago, and since then it’s grown from a handful of users to 50,000 Android phone wielders intent on using their phones sensors to help track and maybe someday help predict the weather. OpenSignal is now looking to the next phase of its weather crowdsourcing program. With a new fob sensor created by Kickstarter project StormTag, OpenSignal wants to broaden the base of smartphones on which it can make climate readings as well as improve the amount and accuracy of the data it receives. 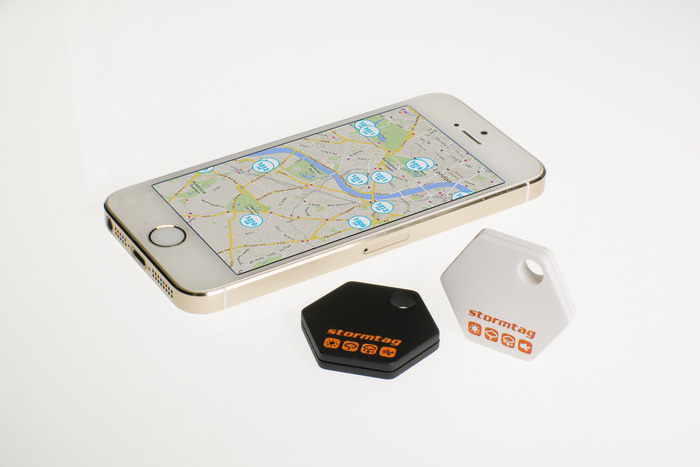 StormTag attaches to a keychain and connects to your iOS or Android device via Bluetooth where it then feeds data into the WeatherSignal app and to OpenSignal’s servers. The $25 version of the StormTag contains barometric pressure sensors and a thermometer, while the $35 StormTag+ adds humidity and UV sensors as well as local storage so it can log data when unconnected to the smartphone. According to OpenSignal’s Samuel Johnston — who pulls double duty as brand strategist and head of weather — the WeatherSignal app has been limited by device capabilities to date. While the iPhone contains plenty of useful sensors, Apple won’t let developers at them just yet. Meanwhile, OpenSignal can collect basic temperature information from any Android phone by measuring the relative heat signature in the phone’s battery. Barometers are also becoming increasingly common in phones. No other phone, though, compares to the environmental sensor-laden Galaxy S4. The miniature weather station is by far the most popular device in the WeatherSignal program, Johnston said. But adding StormTag to the mix will bring open the crowdsourcing program up to iPhone users. In addition, the program’s current members will be able to collect more accurate temperature readings and bring in new data such as humidity and outdoor light levels – useful information not only to the casual observer, but also meteorologists trying to track and predict weather patterns. OpenSignal is already working with meteorologists at the University of Washington and the Met Office (the U.K.’s equivalent of the National Weather Service) to see how its data could be used in prediction models and shared with the general public to produce more granular real-time weather maps. Johnston admits the amount of data the WeatherSignal app collects today is rather minuscule compared to the data collected by weather agencies, but he added that some of its measurements, such as changing barometric pressure readings, could be very useful in weather models, helping to track storms as they happen. Weather sensors seems to be a new emerging trend in the internet of things. In addition to StormTag, another Kickstarter project called CliMate is producing a sensor fob. Last week I wrote about BloomSky, which is building a personalized weather station for your backyard or roof. It plans to launch a crowdsourced beta in SF next month that will measure weather conditions on a neighborhood level.